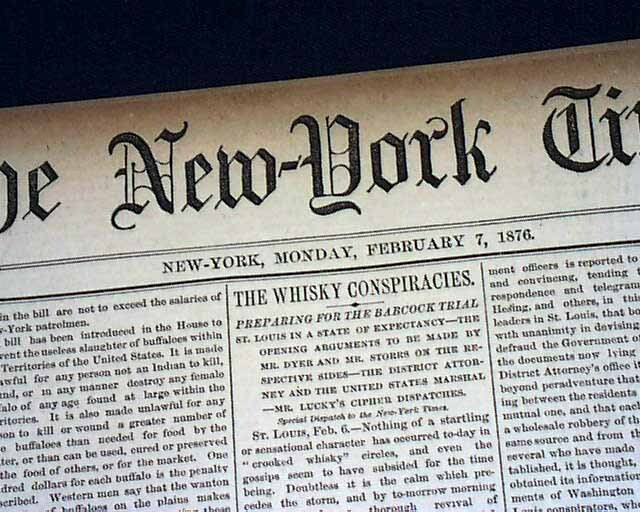 NEW-YORK TIMES, Feb. 7, 1876 On page 2 under "Base-Ball" is a report about a meeting held in New York resulting in the establishment of the National League. 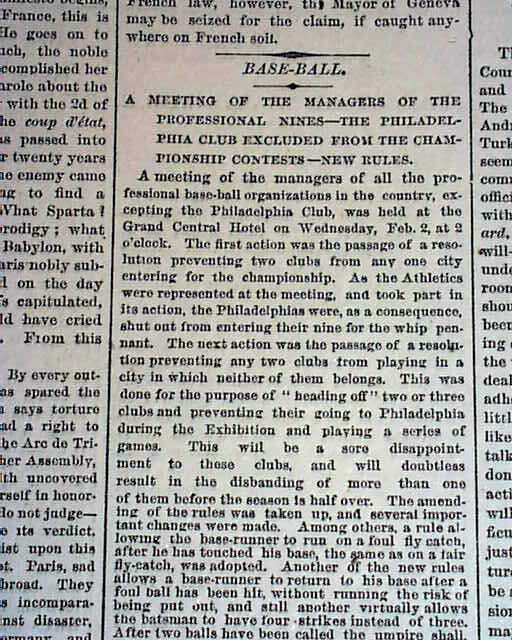 It begins: "A meeting of the managers of all the professional base-ball organizations in the country, excepting the Philadelphia Club, was held at the Grand Central Hotel on Wednesday, Feb. 2..." The report continues mentioning the passage of a resolution concerning "championship play" while the second resolution prevented "...any two clubs from playing in a city in which neither of them belongs." Several rules were amended at the meeting including one that allows "...the base-runner to run on a foul fly catch, after he has touched his base...", while another rule "...virtually allows the batsman to have four strikes instead of three..." followed by an explanation of how this would be done during a game situation. 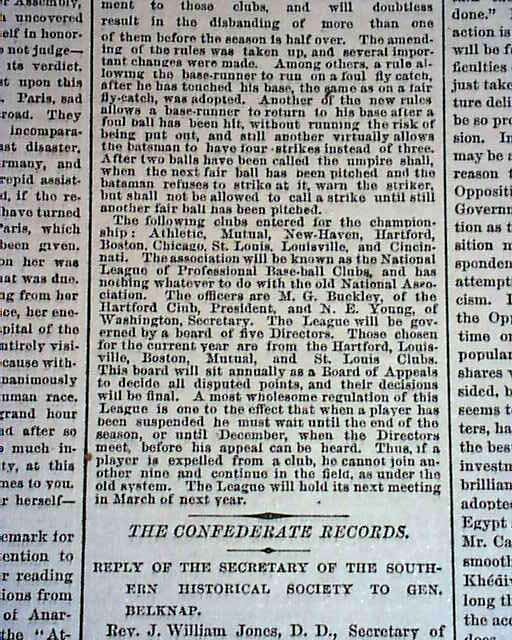 More importantly, there is a list of the teams that would comprise the league, the report stating that: "...The association will be known as the National League of Professional Base-ball Clubs..." and thus the creation of what is commonly referred to as the National League or the "Senior Circuit". 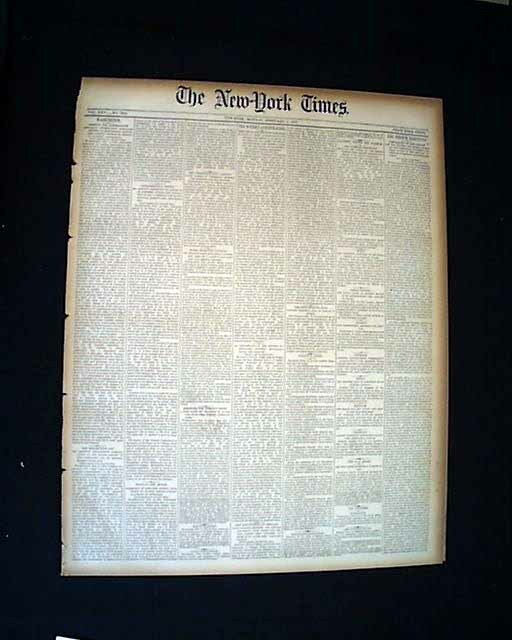 A key issue and a great item relating to the history of the national past time. Eight pages, loose & irregular at the spine, browned at the margins and rather fragile so it must be handled carefully.